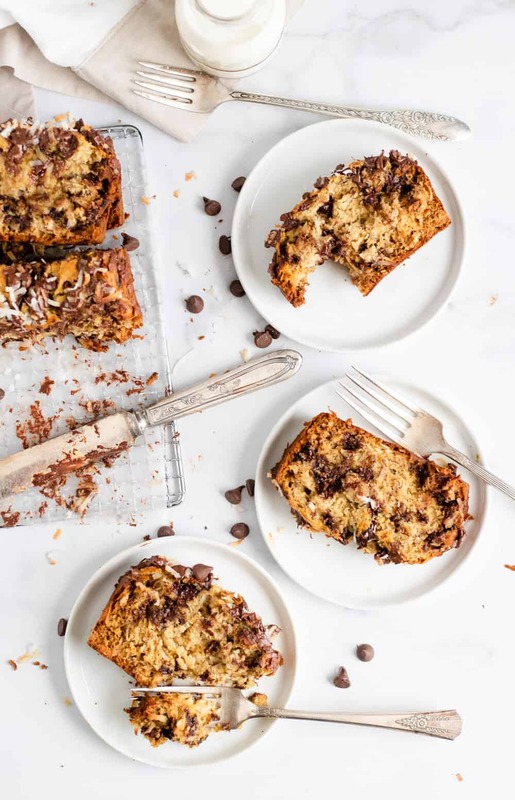 This easy Coconut Chocolate Chip Banana Bread recipe is a fun way to kick your banana bread up a notch. 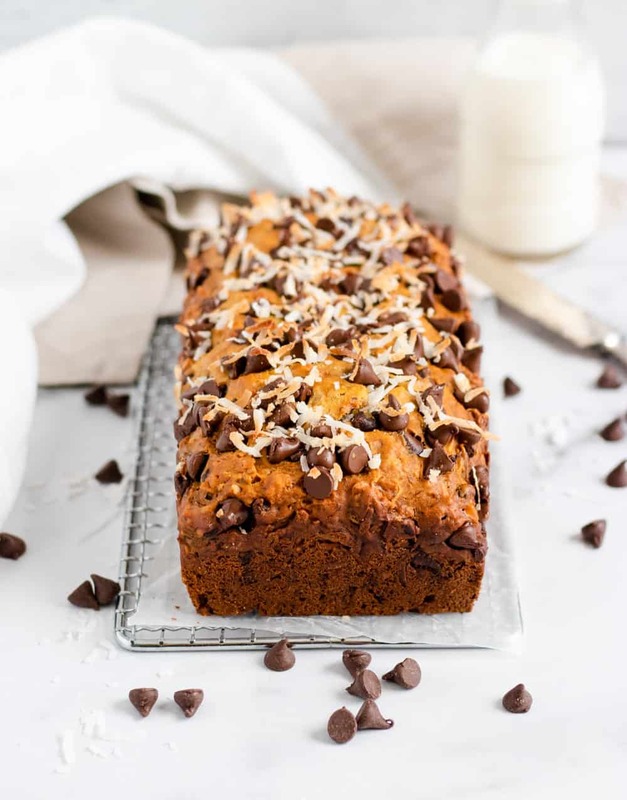 Moist and delicious with a taste of something tropical and loaded with gooey chocolate chips. Certain to be a family favorite! 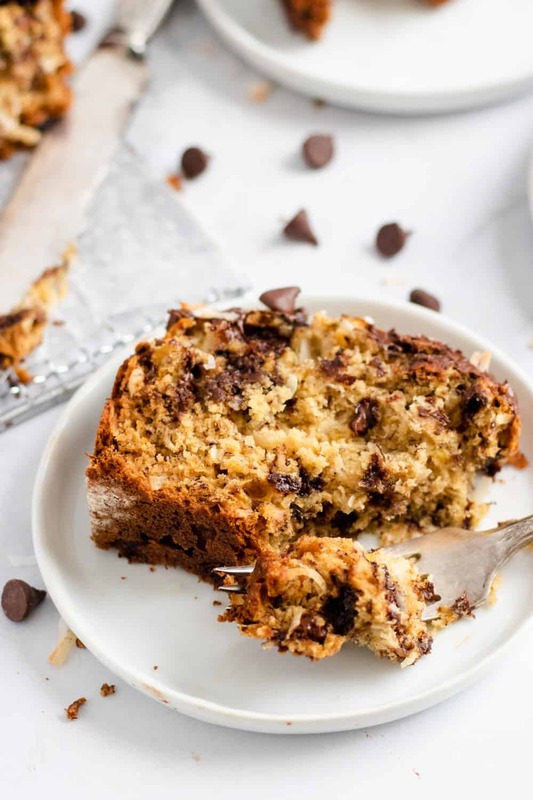 I have a big place in my heart (or stomach) for banana bread. At least once a week, I end up with some brown bananas. 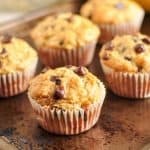 I freeze some for smoothies, make plenty of my Banana Bread Overnight Oats— like I just said, I’m a banana bread kind go girl–and the rest I use them for a good old baked loaf. That’s what I really love about bananas. They technically never go to waste. Even when they are “bad” they are technically still very very good. Not many other foods can say that for themselves. 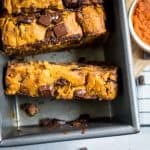 To be honest, when it comes to banana bread, it took me a long time to try anything outside of the classic. Banana bread was banana bread. No fluff, nothing fancy, just rich sweet bread with maybe a hint of cinnamon and some chopped nuts, but nothing more. And then this White Chocolate Almond Banana Bread came to be and I was like WOOOAH. There is life beyond the basic version and it is one beautiful life that I want to be a part of. And then from there, I pretty much went all in. And I haven’t heard any complaints from my readers so I will take that as hint to keep them coming! 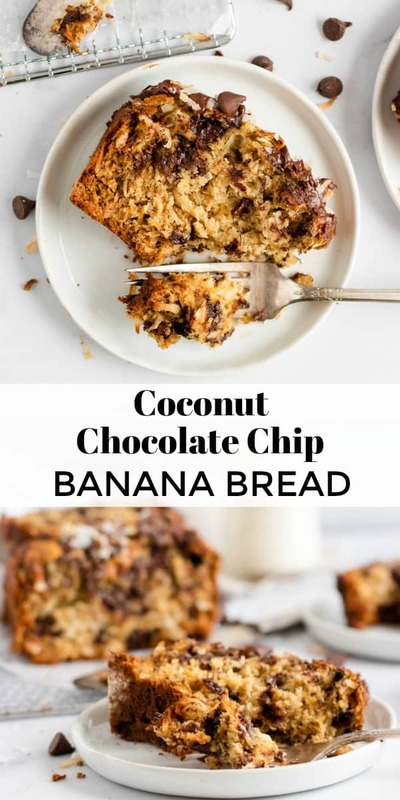 The day this Coconut Chocolate Chip Banana Bread Recipe came to be, the sun was shining and I was craving something tropical. That calls for coconut, right? 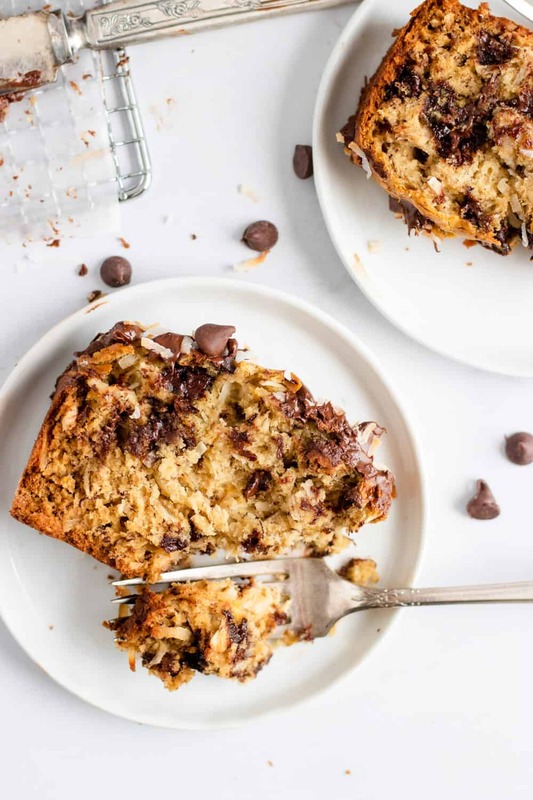 And what better to toss in with coconut than chocolate chips? You guessed it, nothing. 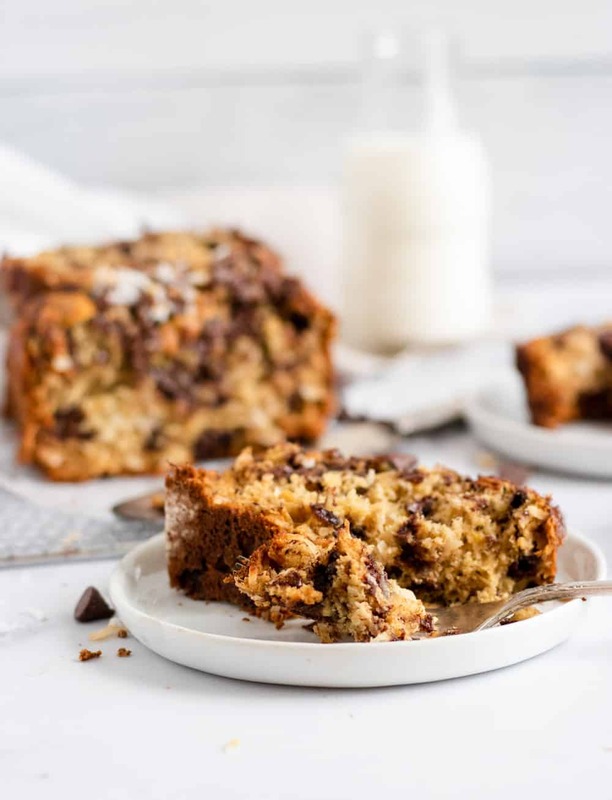 Coconut and chocolate chips baked into the banana bread and then smothering the top makes this sweet, soft goodness a trip to the tropics with each and every bite. Ok. Ok. Not quite, but it is bright and cheery and maybe will remind you of something tropical so that works too. The real problem you may end up having that is not so bright and cheery though is waiting for those darn bananas to ripen! Be patient–it will be worth it, promise! I added coconut both inside the bread and on top. The only issue is that coconut toasts very quickly. I added the coconut on top of the bread about 7 minutes before it was finished baking. About 5 minutes would work as well to get them a bit brown and crispy. If that sounds like more than you feel like paying attention to, you can skip the coconut on the top. It will still be mighty delicious! As with any banana bread, wait until the bananas are very brown and mushy. 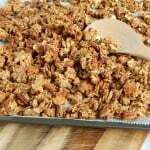 This will get them nice and sweet for the perfect banana bread. Dark chocolate chips, milk chocolate chips, dairy free chocolate chips–you choose. Whatever kind works best for you or whatever you have in the pantry should work just fine. Baking soda and baking powder: make sure these are not expired. Baking powder or soda that is not fresh can make your baked goods turn out not so great. Double check the freshness dates before you dive in! For a gluten free version, a gluten all purpose flour should work just fine. Just make sure it is a 1:1 conversion. Pro tip: I have a friend who uses banana bread to make French Toast. She is clearly a genius. Can you imagine this bread as French Toast?!? In a medium bowl, mash bananas well. Add in egg and whisk together. Mix in butter, vanilla and brown sugar until smooth. In a separate bowl, whisk together flour, baking soda and baking powder. Pour the dry ingredients into the wet and stir. Fold in 2/3 c chocolate chips and 1 c coconut. 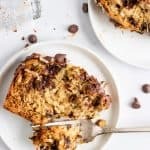 Pour batter into a well greased bread pan and top with remaining chocolate chips. Bake for 40-50 minutes or until a toothpick comes out clean. In the last 5-7 minutes, sprinkle the last 1/3 cup coconut on top of the loaf. Allow to cool before serving.